125,000+ sales, 1,400+ Amazon Reviews, Amazon Debut Bestseller Selection: Prime Reading, Motion Picture Development: AEI. Leah Andrews stumbles upon something inexplicable in southwestern New Mexico: inside a dark cavern lies an undiscovered, Native American cliff dwelling abandoned for 800 years. While twisting through one of the narrow underground passageways, Leah’s flashlight illuminates the remains of a violent massacre. Ancient human remains—all slaughtered in a long-ago massacre—cover the cavern floor, along with a number of brilliantly colored, granite crystals. The rare crystals are native to only one place on earth: a frozen mountain range in central Antarctica. Could Native Americans have traveled to the frozen continent of Antarctica 800 years prior to the first known human exploration? If so how? And why? There’s only one person who can get Leah to those mountains in Antarctica: her estranged husband and climbing guide Jack Hobson. At their destination they make a stunning discovery that will change history and science forever. But Leah’s team is far from the only interested party. 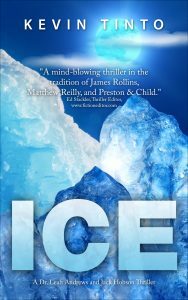 As her secret makes its way to the highest levels of government, a race to seize the Russian-claimed Antarctic territory brings the world to the brink of nuclear conflict.